Some of these handsome boxes were not dissimilar looking to the snuff boxes of the day.The popularity of these items meant they were produced in a variety of different materials. You will find these little graters in silver, wood, enamel and ivory.Found in a variety of different shapes and sizes you might see them shaped as the nut itself or other novelty forms. These tiny little boxes were most often made in sterling silver, though later ones would find the punched grater made of steel. Although extremely rare, examples can even be found in gold. One shape to appear at the time was that of a ceremonial mace, and inside the cylinder you would find a corkscrew. It brings to mind that these little containers were a little like a culinary Swiss Army Knife. They were often found as part of a travel canteen set which would also include a beaker and cutlery. Nutmeg was used to flavour food and when punch was introduced from India in the seventeenth century the little nut found its way into the punchbowl too. It was said to have medicinal qualities that could cause drowsiness and a sprinkling in your punch glass was said to enhance the effects of the alcohol. There were even assumptions that it might improve sight, strengthen the liver or even fight freckles. Owing to the nutmeg's alleged magical powers people would sometimes carry it as an amulet to ward off evil spirits. The inside of an unusual egg-shaped nutmeg grater in sterling silver. Click here to view on our website. Such was the cost of nutmeg it became a fashionable trend and a show of wealth to be able to produce nutmeg when dining and drinking. Perhaps you might offer it up to your companion as well. 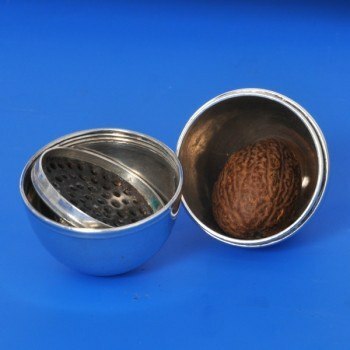 A gentleman could carry his silver nutmeg box, containing a whole nutmeg,and be ready to spice things up whenever he so desired. With flourish, he could be ready to charm and seduce anyone. 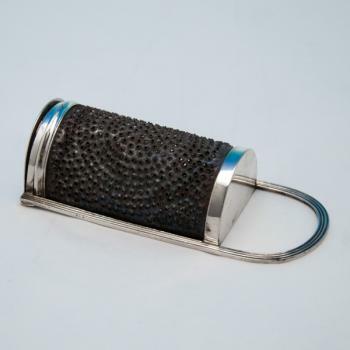 Such was the popularity of these graters that you will find examples made by even the finest of silversmiths of the day such as Hester Bateman. Today, though we tend to assume that our food will be spiced and flavoured to our liking, there is something appealing about the gesture of, maybe, wooing someone by producing your little sterling silver box and offering up this magical spice.